10 "Raise Hell with Chicago Democratic Socialists"
Chicago Democratic Socialists of America is an affiliate of Democratic Socialists of America. If their success on Tuesday carries over to the April 2019 runoff election, as many as five members of the Democratic Socialists of America could be on the Chicago City Council. Two won aldermanic seats outright. Three others made the runoffs. Rosa is one of the two members of the Chicago Democratic Socialists of America who got the majority vote needed to win without a runoff. The other, Daniel La Spata, upset Ald. Joe Moreno in the Near Northwest Side’s 1st Ward. Socialist Rosanna Rodriguez-Sanchez will be in April’s runoff against incumbent Ald. Deb Mell (33rd). Rodríguez-Sánchez broke into tears at her election-night party at Chief O’Neils in Avondale after hearing she’d gotten the most votes in a three-way race. “Chicago had a way of doing politics, and I feel like that died tonight,” Rodríguez-Sánchez said. “I’m very very confident that I’m going to win” in April. Byron Sigcho Lopez, who heads the Pilsen Alliance, credited the socialist organization — which says it’s not a party but instead a “political and activist organization” — with helping him in the race for the seat vacated by retiring Ald. Danny Solis (25th). Sigcho-Lopez will face Alex Acevedo in the runoff. Andre Vazquez, who joined the socialists in June, will be in the runoff against 35-year incumbent Ald. Pat O’Connor (40th). Rosa, who turned 30 in February, had been DSA’s only elected official in Chicago. “For the third-biggest city in the country to have a DSA caucus is amazing, and having members around Carlos will only amplify the causes that working-class Chicago — not the rich — wants,” local DSA co-chair Lucie Macias. The successes of the socialist group’s council candidates set off a raucous celebration at a Chicago watch party at the Logan Square offices of the magazine In These Times, where updates on Tuesday’s vote prompted whoops and swigs from bottles of Malort that were being passed around. After claiming roughly 5,000 members in 2015, the group says there are now about 60,000 card-carrying DSA members nationwide and about 1,300 among three Chicago chapters. Chicago Democratic Socialists of America has staggered two year terms for its officers, but add in two vacancies among the officer positions and you have nearly a whole new crew selected at the June 17 membership convention. The meeting was held in the historic United Electrical Workers Hall at 37 S. Ashland in Chicago. Clara Alcott was elected female co-chair. Leonard Pierce was elected male co-chair. Hope Payton-Carrillo was elected secretary. Dele Balogun and Ramsin Canon will share the political education officer position (but only one vote). Peg Strobel remains as treasurer, that term ending next June. Chicago may not have an elected school board yet, but Our City, Our Schools candidates injected some democracy into Chicago Public Schools’ Local School Council elections and won 15 seats across the city of Chicago 20! Our City, Our Schools candidates included Chicago Democratic Socialists of America members and ally partners. They ran on a platform to fight CPS budget cuts, fight school closings and charter expansions, create sanctuary schools, keep classes below 20 students/fight staff cuts, and fight for a city-wide elected school board. LSCs are elected every two years and are typical made up of 12 positions: 6 parents, 2 community members, 2 teachers, 1 staffer who isn’t a teacher, plus the principal. High schools also choose a student member who serves a one-year term. LSCs vote to approve the school’s budget, evaluate and hire principals, and oversee the school’s Continuous Improvement Work Plan, among other duties. The two year term for LSCs will begin on July 1. You can find full LSC elections results here. Chicago Democratic Socialists of America, April 22, 2018. By October 15, 2017, the group had added nearly 200 new members. 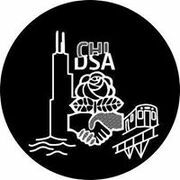 Resistance Culture: A Chicago Democratic Socialists of America Working Group, a Public Facebook Group, as of February 10, 2018. Alexander Billet, Chicago, Illinois. Created group on August 8, 2017. Alec Hudson, Direct Service Provider at Active Visions Inc.
More names had been added by June 7 2018. Clara Alcott Created group on July 6, 2017. By October 15, the group had doubled. By October 15, 2017, several new members were added. Democratic Socialism: An Introduction Public · Hosted by Chicago Democratic Socialists of America. What do we mean by "democratic socialism?" How does it compare to what Bernie Sanders talked about during his presidential campaign? What do democratic socialists have to say about capitalism in the world today? Why do we think it is a form of society that must be replaced? And what might that replacement look like? There will be both presentations and interactive group activities. Light snacks will be served. This workshop / seminar is open to DSA members and friends and is designed particularly for new DSA members who want to better understand DSA's politics and vision. "Raise Hell with Chicago Democratic Socialists"
In 1992, Chicago Democratic Socialists of America members published a six-page leaflet, "Raise Hell with Chicago Democratic Socialists", welcoming progressives into membership. It features comments by United Steelworkers leader Ed Sadlowski; Dr. Ron Sable, the Illinois chair of the Physicians for a National Health Program; Vicki Starr, who appeared in the film Union Maids; political scientist Jane Mansbridge;and theologians Rosemary Reuther and Michael Eric Dyson. On March 12 1993 the West Suburban branch of Chicago DSA held a major forum and debate on the North American Free Trade Agreement. Speakers included Carole Travis of the UAW, Marvin Golden of Greenpeace, philosophy professor Dennis Temple, and a staff member from the office of Representative Harris Falwell, a Republican. In 2005, left opposition to Social Security privatization was organized in Illinois around the Save Our Security Illinois Coalition, which included Chicago Democratic Socialists of America. The Coalition’s first action in Illinois was a 90-person picket line outside the downtown Chicago offices of the Charles Schwab brokerage, a major advocate of privatization. A town hall meeting, with an overflow crowd of 400, on February 28 at Loyola University’s Water Tower campus featured Senators Richard Durbin and Barack Obama and Representative Jan Schakowsky. There was also a major rally in April. Arthur Loevy, Secretary/treasurer of the Amalgamated Clothing and Textile Workers Union, was honored at Chicago DSA's 32nd Annual Debs-Thomas- Harrington Dinner May 4, 1990, at the Midland Hotel. Chicago Democratic Socialists of America's annual Debs-Thomas-Harrington dinner was held on Saturday, May 11 at the Congress hotel. It honored labor stalwarts Steve Culen, Executive Director of Council 31, AFSCME, and Kathy Devine, Labor editor and Co-Coordinator of the Illinois Labor Network Against Apartheid. Demma Strainville, Chair of the Ontario New Democratic Party Parliament Caucus spoke at the dinner. The 44th Annual Chicago Democratic Socialists of America Debs - Thomas - Harrington Dinner, was held May 10, 2002, in Chicago. MC was Reverend Dr. Calvin Morris. Roberta Lynch presented the Debs - Thomas - Harrington Award to Tom Balanoff of the SEIU Building Services Division. Professor Douglass Cassel gave the 44th Annual Debs - Thomas - Harrington Address. Chicago DSA held its 51st annual Eugene V. Debs- Norman Thomas-Michael Harrington Dinner on May 1st, honoring historian, activist, and DSA member Timuel Black and the executive director of the Jewish Council on Urban Affairs, Jane Ramsey. The featured speaker was the Reverend C.J. Hawking. The 2010 Chicago Democratic Socialists of America Debs-Thomas-Harrington Dinner gathered together people representing Chicago’s legal, labor, liberal, and left communities to honor the People’s Law Office and the United Electrical Workers’ Western Regional President Carl Rosen, with author William Greider as featured speaker and Kim Bobo as master of ceremonies. Flint Taylor accepted the award to the People's Law Office from GOPDSA Co-Chair Tom Broderick. Taylor went on to recognize some of the people, present and not, who helped found the law collective and helped make it one of the major resources in defense of civil liberties in Chicago. Carl Rosen accepted the Debs Thomas Harrington award from Chicago DSA Co-Chair Ron Baiman. ed make it one of the major resources in defense of civil liberties in Chicago. The 53rd Debs Thomas Harrington Dinner was held at the Crowne Plaza Chicago Metro on Friday the 13th of May, 2011. William McNary of Citizen Action/Illinois was Master of Ceremonies. Sandra Shimon, a Greater Oak Park DSA member and an Illinois Coalition to Abolish the Death Penalty board member, presented the Dinner award to ICADP's Jeremy Schroeder. In accepting the award, Schroeder made reference to the politics and values represented by Eugene V. Debs. Despite the victory in abolishing the death penalty in Illinois, the work of Illinois Abolitionists is not over. Not only is there the Federal death penalty, but proponents of the death penalty in Illinois are already attempting to bring it back. Chicago DSA co-chair Ron Baiman presented the Dinner award to AFSCME's John Cameron. In accepting the award, Cameron noted that while both public and private employees may be represented in the workplace by a union, public employees, as voters, have some say in the meaning of their work, and this is the essence of socialism. U.S. Representative Jan Schakowsky seized the time and the podium to second the Dinner's endorsement of Cameron's work. Despite now being in the minority in Congress, Schakowsky noted in passing, she was extremely optimistic as the conservatives in Congress have seriously over-reached themselves. Featured speaker was Ralph Martire, the Executive Director of the Center for Tax and Budget Accountability. Martire, who began his career as a corporate lawyer. "Mergers and acquisitions," he sighed. But Martire wielded statistics with passion and clarity to reveal the intersection of tax policy, education, class, and racism. The Dinner closed with the singing of "Solidarity Forever," this time led by Christine Steyer, a singer who graciously donated her talents. The 2013 55th Annual Debs - Thomas - Harrington Dinner was held on May 3 at the Holiday Inn Chicago Mart Plaza's Wolf Point ballroom. Bill Barclay presented the award to the Chicago Teachers Union. And Jesse Sharkey provided a realistic assessment of the balance of power and the tasks ahead for the Chicago Teachers Union. Peg Strobel included in her introduction of Keith Kelleher a much belated (from 2007) greeting from Barack Obama. It was revealed that Kelleher's first date with his wife was to a speech by Michael Harrington at Wayne State University. Ron Baiman conspired with friends like Heather Booth to conduct a small William McNary roast. McNary emerged largely unsinged to warmly defend the Affordable Care Act as game changing legislation. Amy Dean brought her own humor to the table. This page was last modified on 1 March 2019, at 03:39.